The aim of this study was to determine pre-service primary school teachers’ pedagogical content knowledge level as to the operations with fractions based on the pedagogical content knowledge and its components presented by Shulman (1986). The participants were composed of nine senior pre-service primary school teachers in 2011-2012 fall academic year. In this study conducted by a qualitative approach data were collected through interviews and open-ended questions. It was explored that preservice teachers were not adequate with respect to the understanding students and teaching demonstrations and representations knowledge. Specially, a great amount of deficiencies in teaching demonstrations and using model were determined. Bu çalışmanın amacı sınıf öğretmen adaylarının kesirlerle işlemler konusundaki pedagojik alan bilgilerini Shulman (1986) tarafından ortaya konan pedagojik alan bilgisi ve pedagojik alan bilgisi bileşenleri bağlamında araştırmaktır. Çalışmanın katılımcılarını, 2011-2012 eğitim-öğretim yılı güz döneminde son sınıfta öğrenim gören 9 sınıf öğretmeni adayı oluşturmaktadır. Çalışmada nitel yaklaşım kullanılarak veriler açık uçlu sorular ve görüşmeler yardımıyla toplanmıştır. Öğretmen adaylarının, “öğrenciyi anlama” ve “gösterim temsilleri ve yöntemi” bilgisi bakımdan yeterli olmadıkları tespit edilmiştir. Özellikle, gösterim temsilleri ve model kullanımı konusunda büyük eksiklikler olduğu görülmüştür. Pedagojik Alan Bilgisi, Öğretmen Adayı, Kesirler. An, S., Kulm, G. & Wu, Z. (2004). The Pedagogical Content Knowledge Of Middle School, Mathemat- ics Teachers In China And The U.S., Journal of Mathematics Teacher Education 7, pp. 145–172. Ball, D. L. (1990a). The mathematical understandings that prospective teachers bring to teacher education. The Elementary School Journal, 90(4), 449–466. Ball, D. L. (1990b). Prospective elementary and secondary teachers’understanding of division. Jo- urnal for Research in Mathematics Education, 21(2), 132–144. Borko, H., Eisenhart, M., Brown, C., Underhill, R., Jones, D., and Agard, P. (1992). Learning to Teach Hard Mathematics: Do Novice Teachers and Their Instructors Give Up too Easily? Jour- nal of Research in Mathematics Education, 23(3), 194-222. Canbazoğlu, S. (2008). Fen Bilgisi Öğretmen Adaylarının Maddenin Tanecikli Yapısı Ünitesine İlişkin Peda- gojik Alan Bilgilerinin Değerlendirilmesi, Yayınlanmamış Yüksek Lisans tezi, Gazi Üniversitesi, Ankara. Carpenter, T.P., Fennema, E., Peterson, P.L. and Carey, D.A.(1988). Teachers’ Pedagogical Content Knowledge of Students’ Problem Solving in Elemantary Arithmetic. Journal for Research in Mathematics Education. 19. 385-481. Chick, H. And Baker, M. (2006). Pedagogical Content Knowledge for Teaching Primary Mathe- matics: A Case Study of Two Teachers. Cohen, L., Manion, L. Ve Morrison, K. (2005). Research Methods in Education, (Fifth edition), London and Newyork: Routledge, Falmer and Francis Group. Daehler, K. & Shinohara, M. (2001). A complete circuit is a complete circle: Exploring the potential of case materials and methods to develop teachers’ content knowledge and pedagogical content knowledge of science, Research in Science Education 31, pp. 267–288. Fennema, E. & Franke, M. (1992). Teachers’ Knowledge And Its Impact In: D.A. Grouws (Ed) Hand- book of Research on Mathematics Teaching and Learning (New York: Macmillan Publishing). Fernandez-Balboa, J. M. & Stiehl J. (1995). The Generic Nature Of Pedagogical Content Knowl- edge Among College Professors. Teaching and Teacher Education. 11(3), 293-306. Forrester, P. A., & Chinnappan, M. (2010). The Predominance Of Procedural Knowledge In Frac- tions. In L.
Hashweh, M.Z. (2005). Teacher Pedagogical Constructions: A Recon” Guration Of Pedagogical Content Knowledge. Teachers And Teaching: Theory And Practice. 11(3), 273-292. Hill, H. C., Ball, D. L. & Schilling, S.G. (2008). Unpacking Pedagogical Content Knowledge: Con- ceptualizing and Measuring Teachers’ Topic-Specific Knowledge of Students. Journal for Re- search in Mathematics Education. 39(4), 372-400. Isıksal, M. (2006). İlköğretim Matematik Öğretmen Adaylarının Kesirlerde Çarpma Ve Bölmeye İlişkin Alan Ve Pedagojik İçerik Bilgileri Üzerine Bir Çalışma. Yayınlanmamış Doktora Tezi, Orta Doğu Teknik Üniversitesi, Ankara. Jones, A. & Moreland, J. (2004). Enhancing Practicing Primary School Teachers’ Pedagogical Con- tent Knowledge In Technology. International Journal of Technology and Design Education 14, pp. 121–140. Lee, E., Brown, M.N., Luft, J. A. and Roehrig, G. H. (2007). Assessing Beginning Secondary Scien- ce Teachers’ PCK: Pilot Year Results. School Science and Mathematics, 107(2). 52-60. Loughran., J., Mulhall. P. & Berry, A., (2008). Exploring Pedagogical Content Knowledge In Sci- ence Teacher Education. International Journal of Science Education. 30(10), 1301–1320. Lubinski, C.A., Fox, T, and Thomason, R. (1998). Learning to make sense of division of fractions: One K-8 pre-service teacher’s perspective. School Science and Mathematics, 98(5),247-253. Ma, L. (1999). Knowing And Teaching Elementary Mathematics: Teachers’ Understanding Of Fun- damental Mathematics In China And The United States. Mahwah, NJ: Erlbaum. Mcduffy, A. (2004). Mathematics Teaching As A Deliberate Practice: An Investigation Of Elemen- tary Pre-Service Teachers’ Reflective Thinking During Student Teaching, Journal Of Mathe- matics Teacher Education 7, Pp. 33–61. Magnusson, S., Krajcik, J. & Borko, H. (1999). Nature, Sources, And Development Of Pedagogical Content Knowledge For Science Teaching. In J. Gess-Newsome & N. G. Lederman (Eds. ), Ex- amining Pedagogical Content Knowledge (Pp. 95-144). Dordrecht, The Netherlands: Kluwer Academic Publishers. Nagle, L. M., and McCoy, L. P. (1999). Division Of Fractions: Procedural Versus Conceptual Knowledge. In Mccoy, L. P. (Ed. 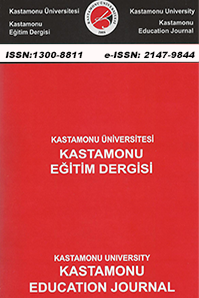 ), Studies İn Teaching: 1999 Research Digest. Research Pro- jects Presented At Annual Research Forum (Winston-Salem, NC), (pp.81-85). ERIC Document Reproduction Service No. ED 443814. O’Hanlon, W. A. (2010). Characterizing The Pedagogical Content Knowledge Of Pre-service Se- condary Mathematics Teachers. Unpublished Doctoral Dissertation, Illınoıs State University. Sánchez, V. & Llinares, S. (2003). Four Student Teachers’ Pedagogical Reasoning On Functions, Journal Of Mathematics Teacher Education 6, 5–25. Shulman, L. (1986). Those Who Understand: Knowledge Growth In Teaching. Educational Re- searcher, 15(2),414. Smith, R.G. (2007). Developing Professional Identities And Knowledge: Becoming Primary Teach- ers. Teachers And Teaching: Theory And Practice, 13(4). 377-397. Smith, D. C, & Neale, D. C. (1989). The Construction Of Subject Matter Knowledge In Primary Science Teaching. Teaching and Teacher Education, 5, 1-20. Sowder, J.T. (2007). The Mathematical Education And Development Of Teachers. In F.K. Lester (Ed. ), Second Handbook Of Research On Mathematics Teaching And Learning. (pp. 157-224). Charlotte, NC: Information Age Publishing. Stacey, K., Helme, S., Steinle, V., Baturo, A., Irwin, K. & Bana, J. (2001). Pre-Service Teachers’ Knowledge Of Difficulties In Decimal Numeration, Journal Of Mathematics Teacher Educa- tion 4, 205–225. Tamir, P., (1988). Subject Matter and Related Pedagogical Knowledge in Teacher Education, Teach- ing and Teacher Education, 4(2), 99-110. Türnüklü, B. E. (2005). Matematik Öğretmen Adaylarının Pedagojik Alan Bilgileri ile Matematik- sel Alan Bilgileri Arasındaki İlişki. Eurasian Journal Of Educational Research, 21, 234 - 247. Uşak, M. (2005). Fen Bilgisi Öğretmen Adaylarının Bitkiler Konusundaki Pedagojik Alan Bilgileri. Yayınlanmamış Doktora Tezi, Gazi Üniversitesi, Ankara. Van Driel, J. H., Verloop, N., & De Vos, W. (1998). Developing Science Teachers’ Pedagogical Content Knowledge. Journal Of Research In Science Teaching, 35(6), 673- 695. ISNAD AKSU, Zeki , KONYALIOĞLU, Alper Cihan . "Sınıf Öğretmen Adaylarının Kesirler Konusundaki Pedagojik Alan Bilgileri". Kastamonu Eğitim Dergisi 23 / 2 (May 2015): 723-738.